I don’t know about you, but with the holidays just around the corner, I’m in a mild state of panic considering how I haven’t even started on my Christmas shopping yet, or even decided who’s actually on said list and who’s getting what. Which is why I’ve been working really hard on the blog’s Holiday 2016 posts, which hopefully will inspire you (and me) along the way. Today’s #whattobuyforchristmas post happens to be from Burberry, and more specifically, the Mini Buckle Tote, the tiny wonder of a bag charm that measures just 10 cm by 9 cm by 4.5 cm. Big enough to hold your barest essentials, think credit cards, cash, loose change and a lippy or two, it also comes in festive-approved hues like Bright Pink, Emerald, Gold andPale Orchid on shimmery metallic leather to give that extra bit of oomph to most any dull bag you wish to hang it on. Priced at SGD575, you can pick it up at any Burberry boutique or just do it online, since Burberry ships most anywhere in the world. And speaking of online, you can also browse Burberry’s thoughtfully curated gift guide here, where you’ll find everything for men, women and children, along with a selection of beauty and home gifts, some of which you can take a step further and personalise with your intended’s own initials. From cashmere scarves to nylon rucksacks, and from trench coats to bottles of fragrance, you can truly make it personal with Burberry this season. If you intend to do nothing else today, you should at least watch this, Burberry’s festive film of the season: The Tale Of Thomas Burberry. Featuring a stellar cast, a haunting soundtrack and a story with so many twists, it’s actually a let-down to discover it’s only after all still a commercial, and not the trailer of a soon-to-be-released movie. Partly fictional (because true life can’t be so drama, right? ), the tale follows the ‘life’ of actor Domhnall Gleeson (About Time, Harry Potter) who plays Thomas Burberry, inventor, lover and one who’s deeply passionate about this craft. There’s Sienna Miller playing his first love Sara, Lily James as Betty, inspired by real-life pilot Betty Kirby-Green, who in 1937 completed a record-breaking round trip from England to Cape Town in ‘The Burberry’ plane (and also his second love, Betty, not the plane), and finally Dominic West as acclaimed polar explorer Ernest Shackleton, for whom Burberry first created his now famous gabardine fabric for. Shot over six days in England, the short film is directed by Asif Kapadia, with the screenplay written by Academy Award nominee Matt Charman. Interesting nuggets to note? Sets from the film, including Thomas Burberry’s workshop, were inspired by archive materials. The cast also wears pieces you can now buy as part of the British luxury house’s festive collection, from Sienna’s lightweight cashmere scarf to Domhnall’s wool waistcoat. Want Dominic’s Westminster trench coat that he wears on his journey to the Antarctic? It’s all online for you to shop, which is especially dangerous after watching such a beautiful, heart-wrenching ‘commercial’. I, for one, now want Sienna’s (Sara’s) long scarf as she gallops away into the night after finding out that Domhnall (Thomas) is really in love with Lily (Betty). Watch the film and you’ll know what I mean. Sigh. To celebrate the month of Ramadan, Burberry is launching a special collection just for the Middle Eastern markets, and while us here in Singapore (and the region) won’t be getting any, I am taking this opportunity to showcase Burberry’s Patchwork, their bag-of-the-season that’s a true gem in all senses of the word. 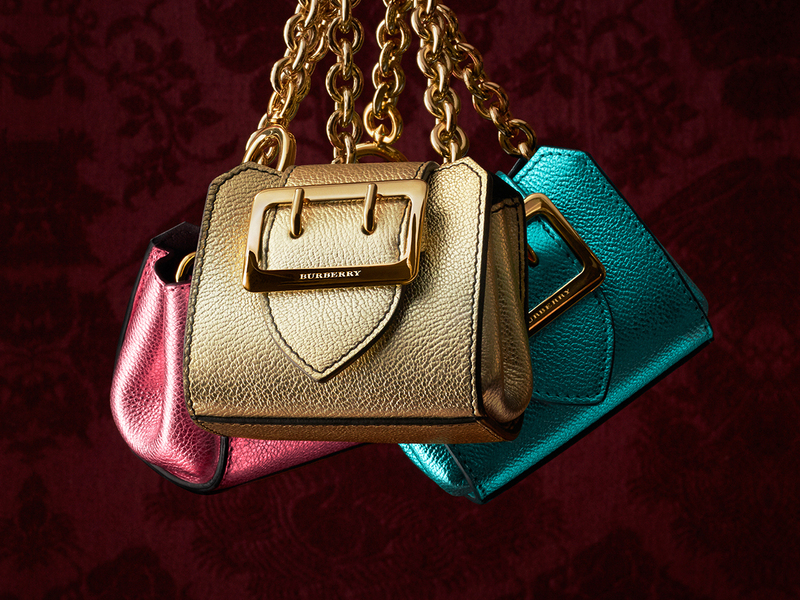 Small as it might be, from its accordion-gusseted body to the oversized buckle on the front of the bag. Then there’s the sling, which is thick and chunky, and you could even say it’s out of proportion with the bag proper, but I guess that’s why this juxtaposition works. And because it is as thick as it is, it does sit comfortably on the shoulder. Or you could just remove the sling and use the bag as a clutch, but I would prefer to just leave it be and let the sling hang ever so nonchalantly at the side. It’s a head-turner, it’s a statement bag but the best thing about it is the fact that each piece is also a one-of-a-kind. Instead of making one bag many times, they made the Patchwork in over 3000 variations, which means you’ll never (and I repeat, never) spot the same bag on Mrs Tay who’s having dim sum with you and the gals at the same table during your society get-togethers. Priced at SGD3795 apiece, which in my opinion is quite the steal as well, considering how much exotic snakeskin they use on each Patchwork bag, you can head on down to Burberry stores in Singapore or online to view what’s available before deciding on which one you love the best. The Burberry Fringe Suede Bucket Bag is inspired by the 70’s. The bag is so very bohemian with its layered fringes. Big enough to fit your daily essentials for work with a small detachable leather pouch to store loose change, the Burberry Bucket bag is available in chocolate brown, tan and black. Exciting new summer handbag trends are emerging this week, and celebs' designer selections are all over the place (in a good way). Also, as you've obviously gathered, Beyoncé makes an appearance, as well as several more of our favorite supermodels and/or television personalities, and they have all chosen to reward us for our patience and admiration with some extremely colorful wardrobe and hair choices. What a time to be alive! Does this door look familiar to you? That's because it's the door to The Nice Guy, and it witnesses more celeb entrances and exits every day than TMZ. (Maybe. They're pretty well staffed, actually.) This is Bella Hadid, leaving the restaurant with her Be Dior Bag. Here's Queen Bey, out in NYC with Jay-Z. She's carrying a colorful velvet and leather Burberrysatchel that really pops with her eye-catching ensemble. (I love the parrots.) We just featured a very similar version of the Milverton in one our Best Bag Deals round-ups last month, but as you might suspect, it is now sold out. Amanda recently included the Céline Trotteur in her post about the next wave of bags about to have their moment, and here it is on the arm of Chrissy Teigen. Amanda knows all. Chrissy carried this exotic version of the Trotteur to a recent dinner date with her husband at Craig's. Here's Jay-Z, holding the door for Bey (I assume) while out in NYC. He's carrying a simple black leather Givenchy backpack. Is it me, or is all the light gone from his eyes? Maybe it's just the shades. Karlie Kloss was recently spotted grabbing coffee in NYC while carrying a neutral leather Max Mara Whitney Tote. I've always loved this bag, and I don't understand why more celebs don't love it. Stars, they're just like us: they overdo it with the nightlife and then have to dive into the nearest CVS for something hydrating. Here's Kylie Jenner, doing just that in LA after a night of partying. She's carrying a logo'd bicolor Gucci backpack. Here's Sofia Vergara, shopping for furniture in Beverly Hills with a multi-textured Birkin. Sofia has many Birkins, and they might deserve their own post by now. You can see several of them in The Many Bags of Sofia Vergara. Ever so often I’ll get an email or two, asking about Burberry totes and hobos from a particularly season. And if I recall correctly, it was the same season when I was in London for the runway presentation, my first ever, many years ago. The bags in question looked similar to this, the Burberry Large Bridle House Check Hobo, and with its thick bridle detailing, House Check coated canvas body, large and roomy disposition, it’s certainly not hard to see why it’s so memorable. Priced atSGD1995 and measuring 36 cm by 37 cm, I would often direct those queries online, and tell them to check it out in Dark Tan or Black (shown above). And if the one here is much too big for your liking, there are others to choose from in many other shapes and sizes, including totes, bucket bags and clutches in the sameHouse Check/bridled leather detailing.